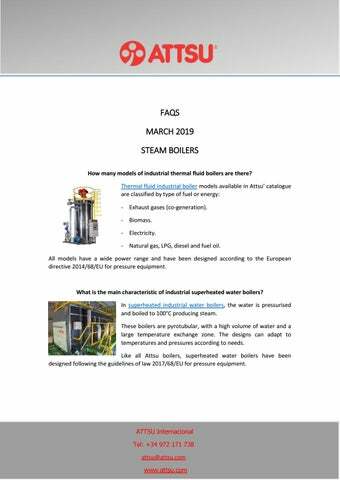 FAQS MARCH 2019 STEAM BOILERS How many models of industrial thermal fluid boilers are there? Thermal fluid industrial boiler models available in Attsu' catalogue are classified by type of fuel or energy: - Exhaust gases (co-generation). - Biomass. - Electricity. - Natural gas, LPG, diesel and fuel oil. All models have a wide power range and have been designed according to the European directive 2014/68/EU for pressure equipment. What is the main characteristic of industrial superheated water boilers? In superheated industrial water boilers, the water is pressurised and boiled to 100Â°C producing steam. These boilers are pyrotubular, with a high volume of water and a large temperature exchange zone. The designs can adapt to temperatures and pressures according to needs. Like all Attsu boilers, superheated water boilers have been designed following the guidelines of law 2017/68/EU for pressure equipment. How do steam boilers work with biomass? Biomass steam boilers recover the heat generated during the biomass combustion process to heat the water in the boiler exchanger circuit. The hot water is then diverted to the heating circuit. Occasionally it is necessary to remove the ashes generated by biomass combustion and clean the burner. Are there natural gas, LPG, diesel, fuel oil and biogas-fired steam boilers? Yes, within the Attsu catalogue we find a wide range of steam boilers that run on natural gas, LPG, diesel, fuel oil and biogas. These include thermal fluid boilers, superheated water boilers, hot water boilers and steam boilers. They are all available in a wide range of power ratings and are designed to comply with the European Pressure Equipment Directive 2014/68/EU. Should you require further information about specific models, please do not hesitate to contact Attsu' sales department.